Henoch–Schönlein purpura (HSP) is a condition that affects different parts of the body. Tiny blood vessels in the body become inflamed or swollen. HSP happens in people of all ages, but is most often seen in children under 10 years of age. It is not contagious, so cannot be passed on to other people. Children with HSP get red or purple raised spots on their skin. They may have pain in their joints and/or tummy, and they may feel sick and tired. Sometimes HSP also affects their kidneys, causing blood cells and proteins to ‘leak’ into the urine. Usually, children with HSP do not need special treatment, but will need to be carefully monitored and may need to stay in hospital and/or take medicines. Most children start to feel better after several days or a few weeks, and the rash and other symptoms disappear. HSP occasionally comes back, usually within a few months, and may need further treatment. A few children have long-term problems, especially when their kidneys are affected. They will need to be monitored and may need specialist treatment. sometimes, urinating less often or passing smaller amounts. Some children have complications – health problems that happen because of the condition. swelling or puffiness in different parts of the body, especially around the eyes, legs and feet (oedema). Very rarely, the kidney problems get worse quickly (rapidly progressive glomerulonephritis), and this may cause the kidneys to stop working over a short time (acute kidney injury). very occasionally, the brain, spinal cord or lungs are affected. HSP is linked to the immune system, which normally protects the body from infections and disease. Many children with HSP first get symptoms with or after an infection – usually in the throat or tonsils. HSP is a systemic condition – this means it affects different parts of the body. The blood vessels swell and leak fluid into the tissues around the blood vessels, causing the symptoms. Most of us have two kidneys. They are part of the urinary system, which gets rid of things that the body no longer needs, so that we can grow and stay healthy. The kidneys filter blood and remove extra water, salt and waste in urine (wee). In about half of children with HSP, the kidneys are affected. The tiny blood vessels in the kidneys, which filter blood to remove extra water, salt and waste into the urine, become inflamed. This causes the kidneys to ‘leak’ blood cells and proteins into urine. This is sometimes called HSP nephritis. Your child will need some tests to diagnose HSP and find out whether he or she needs any treatment. Your child’s doctor will examine your child, discuss his or her symptoms, and check his or her blood pressure. Your child will need one or more urine tests. He or she may need other tests, such as blood tests and an ultrasound scan. A few children need a biopsy of the skin and/or kidneys – a tiny piece of tissue from the skin or kidney is removed from the body with a needle and examined under microscopes. Special medicines are used so your child does not feel any pain or can sleep through the procedure. Where will my child be treated? Your child will probably be treated in a paediatric unit, a special part of your hospital for children. He or she will be looked after by a paediatrician, a doctor who treats babies, children and young people. Your child may need to stay in hospital for a few days or longer. However, children with HSP usually have most of their care as outpatients, visiting the hospital during the day. A few children with HSP are referred to a paediatric renal unit, a specialised unit that treats babies, children and young people with kidney problems and may be in a different hospital to your own. Your child will be looked after by a team, including a paediatric nephrologist, a doctor who treats children with kidney problems. Most children do not need special treatment. To relieve pain, your child may take medicines such as paracetamol (e.g. Calpol). Do not give your child ibuprofen (e.g. Brufen) as it can cause further damage to his or her kidneys. Some children need to make temporary changes to what they eat or drink, or take medicines to try to reduce the amount of protein lost in their urine, control their blood pressure or treat any complications. Will my child get better? In most children, the symptoms and signs of HSP go away within one month, though some children will have problems for three months or even longer. The purpura on the skin disappears – and usually does not leave any scars – and the joint pain and tummy pain go away. This is called remission. In a few children, the symptoms and signs come back, usually within one year. This is called a relapse. These children may need further treatment. Your child will probably need to be seen regularly by a doctor for some weeks, to check for any problems with his or her kidneys. After your child recovers, he or she may need follow-up appointments once a year for urine tests and blood pressure measurements. If your child has acute kidney injury (when the kidneys stop working properly), he or she will need follow-up throughout their life. Most children have no long-term effects from HSP. Some children continue to have haematuria (blood in their urine) – this usually cannot be seen but is picked up on a urine test. Up to 15 children in 100 continue to have proteinuria (protein in the urine) one year after the initial episode of HSP – they will need to be monitored . A small number of children (less than 5 in 100) with HSP have long-term problems with their kidneys – this is called chronic kidney disease (CKD). Their kidneys stop working as well as they should – this happens slowly over many years. If your child has CKD, you will learn more over time about how to help manage the condition, and what to expect. HSP can affect different parts of the body and the symptoms vary among different children. All children with HSP have purpura, red or purple spots, over their skin, which look like a rash. These spots are usually raised so you can feel them (we say they are palpable). They are usually in groups and symmetrical (they look the same on both sides). The purpura usually appear on the feet and ankles, legs, buttocks, lower back and arms. Children under 2 years may also have purpura on their head, chest and back. Your child may get more purpura as time goes on. The purpura happens when the small blood vessels under the skin get inflamed and leak blood into the surrounding tissues. It is not contagious, and other people cannot catch purpura by touching your child’s skin. Your doctor or nurse will give you more information about anything you need to do to. You may wish to speak with staff at your child’s nursery or school about the rash. They may be able to reassure other families that the rash cannot be passed on. In most children with HSP, the purpura goes away after several weeks, though some will have a rash for a few months or longer. It is rare for the purpura to leave any scars. Many children with HSP have pain and/or swelling in their joints. This usually happens in their knees and elbows, and sometimes their ankles and wrists. In some children, the pain may be severe, and may cause difficulty walking or moving around. sometimes, have blood or mucus in his or her stools (poo) or vomit. Your child may feel more tired than usual. Some boys have orchitis, when the testicle becomes inflamed – this can cause the scrotum to swell up, and become tender and red. If you think this may be happening to your child, take him to your doctor. In a few children with HSP, one part of the bowel (intestine) slides into the next part – this is called intussusception. This is like the parts of a telescope folding into each other. The walls of the intestine can press against each other and create a blockage, which can lead to swelling and less blood flowing into the affected areas. It usually happens suddenly. pass stools with blood in them – they may look like redcurrant jam or jelly. Your doctor can diagnose intussusception by doing a physical examination and doing tests, including blood tests and imaging tests (scans). Children with intussusception will need treatment at a hospital. This may be a type of enema (pushing air or liquid into the back passage to cure the blockage) or surgery. Your doctor will give you more information. Very rarely, the brain, or lungs are affected. Children with HSP affecting the brain can appear confused or unresponsive or can have fits (seizures). If the lungs are affected then this can causing bleeding in the lungs. These are very rare and will need treatment in a hospital. If this is the case your doctor will give you more information..
What can happen when HSP affects the kidney? In about half of children with HSP, the kidneys are affected, leading to the following. These may not happen for some days or weeks after the above symptoms. Haematuria (blood in the urine). This happens when red blood cells leak through the kidneys' filters into the urine. Sometimes you cannot see the blood, but if there is a lot, the urine may be coloured red or dark brown (like a cola drink). Proteinuria (more protein in the urine than normal). This happens when proteins leak through the kidneys' filters into the urine. You cannot usually see the protein, but it is picked up on a urine test. Some children urinate less often or pass smaller amounts. This is referred to as HSP nephritis (HSP with kidney involvement). This may cause some of the following problems. Hypertension, blood pressure that is too high, can occur in HSP nephritis. There are often no symptoms, though some children develop headaches, vomiting or blurred (fuzzy) vision. Hypertension that lasts a long time can also increase the risk of getting other diseases in adulthood. These children will need to control their blood pressure so it is in the healthy range. They may need to reduce the amount of salt they eat or make other changes to their diet. Some children take medicines to help control their blood pressure. Some children with HSP nephritis get swelling or puffiness in different parts of the body, especially around their eyes, legs and feet – this is called oedema. In HSP, the kidneys sometimes leak a large amount of one type of protein – especially a type called albumin – into the urine, and so there is not enough in the body. Albumin helps fluid (water) move in and out of the bloodstream, so that the body’s cells can be nourished, or fed. When there is not enough albumin in the blood, the fluid cannot move back into the bloodstream. The fluid stays in parts of the body, and this causes the swelling. When this happens it is called nephrotic syndrome. Very rarely, the kidney problems get worse quickly – this is called rapidly progressive glomerulonephritis or crescentic glomerulonephritis. This may lead to acute kidney injury (AKI) – when the kidneys stop working over a short time. Some children get better after a few weeks, and some need to take medicines or have more intensive treatment. HSP is a systemic condition – this means it affects different parts of the body. It is a type of vasculitis – the blood vessels are inflamed (swollen) and leak fluid into the tissues around the blood vessels. HSP gets its name from two German doctors who described the condition – Edouard Henoch and Johan Schönlein. Many children with HSP first get symptoms with an infection, caused by bacteria or viruses (germs). This infection is not in the kidney, but usually in the throat or tonsils. Most children recover from these infections. But, in a few children the infection seems to trigger HSP. HSP seems to be linked to the immune system, which normally protects the body from infections and disease. A protein called immunoglobulin A (IgA), which is made by the immune system, gets trapped in small blood vessels, causing the swelling. The immune system protects the body against germs such as bacteria and viruses that can cause illness. These germs can enter the body in lots of ways, such as by the nose and throat or the urinary system. If we get a cold or flu, this means that a virus germ has got into the body and started to infect some of our body’s cells. Germs have special ‘markers’ that are different from the markers on our own body’s cells. This means that the immune system can recognise that they are germs and kill them. We often feel sick for a few days or a few weeks while this is happening. The immune system has many different ways to protect the body against disease. Some of the parts include those listed below. White blood cells are living cells in the blood. Often, the number of white blood cells found in a blood test can give information about someone’s immune system. The two main types of white blood cells in the immune system are neutrophils and lymphocytes. Antibodies or immunoglobulins recognise the germs that have come into the body, and can bind (stick) to them. There are five types: immunoglobulin A (IgA), immunoglobulin D (IgD), immunoglobulin E (IgE), immunoglobulin G (IgG) and immunoglobulin M (IgM). The complement system is made up of other proteins that float in the blood. These proteins work with (complement) other parts of the immune system to help kill germs or cells infected by germs. Normally, the body controls when complement is activated, so it does not attack the body itself. Sometimes the immune system does not work as expected and can cause problems. For example, sometimes the immune system cannot recognise the body’s own cells and may attack them as if they were invaders like germs. In about half of children with HSP, the kidneys are affected. This is sometimes called HSP nephritis (‘nephritis’ means kidney disease). The kidneys have many filters that clean blood to remove water, salt and waste into urine. These are made of up of tiny blood vessels called glomeruli. In HSP, immunoglobulin A (IgA) is deposited (placed) on the filters, causing them to swell. They leak proteins and blood cells into urine. Inside each kidney, there are about one million nephrons. 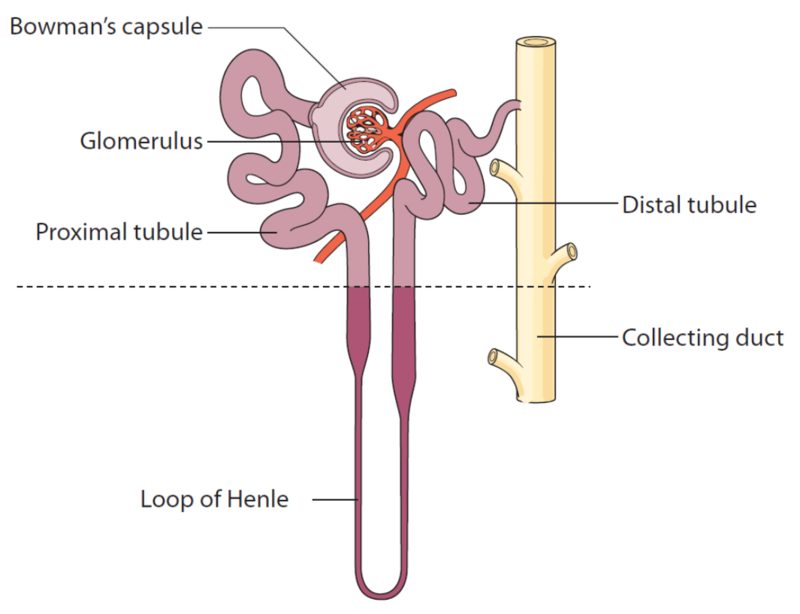 Each nephron is made up of a glomerulus (when we talk about more than one glomerulus, we say glomeruli), and a renal tubule. Each glomerulus acts like a sieve, helping to remove extra water and waste from the body, and holding on to blood cells and protein, which the body needs. Blood flows into the kidneys and to each glomerulus. Most of the water and some other substances in the blood pass through the glomeruli. This liquid flows into the renal tubule. Most of this liquid moves back into the bloodstream. The rest of it becomes urine. The urine leaves the kidney by the ureters and goes into the bladder, where it is stored until we are ready to go to the toilet. A protein called immunoglobulin A (IgA) gets trapped in the glomeruli. This causes the glomeruli to become inflamed (swollen) or damaged. The damaged glomeruli can let blood cells and protein through, which means they go into the urine. Doctors think that HSP with kidney involvement is related to the kidney condition, IgA nephropathy – the same proteins (immunoglobulin A) are trapped in the glomeruli. However, in IgA nephropathy only the kidneys are involved, and children do not have a skin rash, joint pain or abdominal pain. HSP does not usually run in families. If one of your children has this condition, it is unlikely that another of your children or another family member will get it. It is not contagious, and cannot be passed on to other people. Your child will need some tests to diagnose Iidentify) HSP and find out whether he or she needs any treatment. Your doctor will do an examination, measure your child’s blood pressure, and do one or more urine tests. Your child may need other tests, such as blood tests, an ultrasound scan or a biopsy of his or her kidney or skin. Your doctor will talk to you or your child about their symptoms and any medicines that he or she takes. The doctor will examine your child – for example, to look at the purpura (rash). Your doctor or nurnse will check your child’s blood pressure. This is because HSP may lead to high blood pressure (hypertension). You or a nurse will need to collect some of your child’s urine in a small, clean container for a urine test. A dipstick will be dipped into the urine – this is a strip with chemical pads that change colour depending on what substances are in the urine. This shows whether there are blood cells and/or protein, which are signs of HSP with kidney involvement. The sample may also be sent to a laboratory for more accurate tests. the amount of other substances, including important chemicals called electrolytes. Urea and creatinine are chemicals that are made in the body. They are normally removed by the kidneys into urine. In severe cases of HSP, these may build up in the blood. The kidney function can be checked by measuring the glomerular filtration rate (GFR). The GFR is the amount of fluid the kidneys filter each minute. It can be estimated by measuring the amount of creatinine in the blood. A blood test can check levels of immunoglobulins or antibodies – the body’s immune system makes these unique proteins to identify and kill specific germs. This gives information about whether there has been an infection, and sometimes which germ caused it. Some children with HSP have high levels of immunoglobulin A (IgA), an antibody, in their blood. When the kidney is involved, IgA can be trapped in the glomeruli, the kidney filters. Some children with HSP lose a lot of protein in their urine, when it is leaked through the glomeruli. This means there is less protein in their blood, especially a type of protein called albumin. Because albumin is smaller than other proteins, it is more likely to leak through the glomeruli. calcium is important for bones and teeth, helps blood to clot and also helps the muscles, including the heart muscle, to work. A full blood count (FBC) counts the numbers of different types of blood cells – a higher or lower level of these may be a sign of infections or other health problems. A blood clotting test look at how the blood forms clots, when the blood clumps together – for example, when we have a cut, to stop the body losing too much blood. Some children need imaging tests (scans). These use special equipment to get images (pictures) of the inside of their body. Ultrasound scan – looks at the shape and size of kidneys and other parts of the urinary system. A special probe (like a stick or wand) with jelly on its tip is moved around your child’s skin. It uses sound waves to create an image on a screen. Boys who have swelling in their scrotum may also need an ultrasound scan of this part of their body. Chest x-ray – for children with breathing problems, chest x-ray checks for any fluid (liquid) around the lungs. Your child sits or lies still for a few seconds while a machine takes x-ray pictures. In a biopsy, a tiny piece of a body tissue is taken from the body and examined under microscopes. Special medicines are used so your child does not feel any pain or can sleep through the procedure. A skin biopsy can confirm whether the purpura is caused by HSP. This is rarely needed and your doctor will give you more information about this procedure. acute kidney injury – when the kidneys stop working properly over a short time. It can take a few weeks to get the results from a biopsy. Most children with HSP do not need special treatment. They are carefully monitored by a team of healthcare professionals at the hospital. Most children recover from HSP after a few weeks or a few months – the purpura (rash), joint pains and stomach pains disappear. Some children need treatment – for pain, complications or kidney problems – which are explained below. It is important that your child follows any treatment plan outlined by your doctor. Your child may need to stay in hospital for a few days or longer. However, children with HSP usually have most of their care as an outpatient, visiting the hospital during the day. A few children are referred to a paediatric renal unit, a specialised unit that treats babies, children and young people with kidney problems and may be in a different hospital to your own. They are looked after by a paediatric nephrologist, a doctor who treats children with kidney problems. check your child’s blood pressure. To help manage any joint or tummy pain, your child may take medicines such as paracetamol (e.g. Calpol©). You can get paracetamol or other medicines for pain from your pharmacist, in a form that is best for your child. Make sure you follow the instructions given with the medicine. Wait at least 4 hours between doses of paracetamol, and do not give more than four doses in 24 hours. Speak with your doctor or nurse if you need more support. Do not give your child ibuprofen (e.g. Brufen) – this medicine may cause further damage to kidneys that are affected by HSP. hypertension – to reduce or control blood their pressure so it is in the healthy range. These are usually medicines called angiotensin-converting enzyme inhibitors (ACE inhibitors) or angiotensin-II receptor blockers (ARBs). Common ACE inhibitors are: captopril, enalapril and lisinopril. Doctors understand that, in some children, these medicines will reduce the risk of long-term kidney problems. It is important that you follow your doctor’s instructions about when and how much to give. Do not stop the medicine suddenly. Steroids are chemicals that are made naturally in the body but can also be made as medicines. They suppress the immune system – stop it from working to avoid harming the body. Your doctor will let you know how often and for how long to give the medicine. He or she will work out the amount of medicine (dose) that is right for your child – this will be shown on the medicine label. It is important that your child has the vaccines (immunisations) that he or she needs to reduce the risk of some diseases. Speak with your doctor about these – some vaccines (live vaccines) are not safe to give while a child is taking steroids. is unwell and you are worried about an infection. If your child does get an infection, he or she may need to take an antibiotic medicine, which kills the germs that cause infection. Your child must take the medicine for the number of days that the doctor has told you, or until all of the medicine has been taken. We use medicines to help children get better, but sometimes they have effects we do not want – side-effects. bad stomach pain or repeated vomiting – sometimes steroids can cause ulcers in the stomach. high blood pressure (hypertension) – your child’s blood pressure will be regularly checked, and if it is too high, will need to be controlled by eating a diet with no-added salt. When steroids are needed over a long time, or in high doses, they may have other side-effects. When steroids are needed over a long time, or in high doses, they may have other side-effects. If you have any concerns, talk to your doctor. All steroid medicines, including prednisolone, may affect the adrenal glands so that they produce less of a hormone called cortisol when the body is stressed (e.g. during illness or injury). This means that your child may have more difficulty fighting off an infection, or may recover less quickly from injury or after surgery. If your child is unwell and you are worried about an infection, contact your doctor straight away. Steroids can slow growth and affect puberty. They can also cause growth of body hair and irregular periods in girls. Your doctor will check your child’s growth and development. Your child’s skin may become thinner, and heal more slowly than usual. Acne (spots) may become worse, or your child may develop mouth ulcers or thrush (candidiasis). Your child may develop problems with their hip bones, or their bones may become weaker (osteoporosis). The muscles around their hips and shoulders may also become weaker. 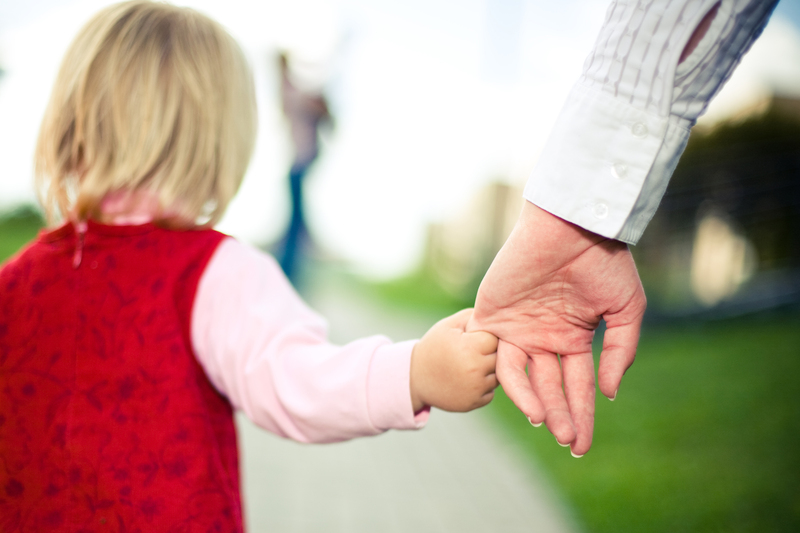 If your child has any difficulty walking or moving around, contact your doctor. Occasionally, steroids cause diabetes. If your child seems more thirsty than normal, needs to pass urine (wee) often, or starts wetting the bed at night, contact your doctor. Children who have oedema, are taking steroids or have acute kidney injury may need to make temporary changes to what they eat and drink. For example, they may need to eat a no-added salt diet and less of certain foods, and/or drink less fluid, such as water, squash and soft drinks. Eating too much salt can worsen oedema (swelling in the body) and can increase the risk of developing hypertension (high blood pressure), especially while on steroid medicines. Your child should avoid eating or drinking lots of salted nuts, crisps, crackers, soft drinks, fast food meals, takeaways and processed foods (meals that are pre-prepared, including soups) – these often have more salt than we think. Do not add extra salt to meals that you cook or at the dining table. Some children with HSP develop reduced kidney function, which means that their kidneys do not work as well as normal. The severity of this varies, but most do not need any special treatment and their kidney function will return to normal. A very small number will have more serious kidney problems and will need dialysis. This uses special equipment or a machine to do what a healthy kidney does – remove waste products and excess water from the body. Most of these children need this treatment for a short time only, but a few need it for longer. What treatment does my child need? How will the treatment help my child? How long will my child be in hospital? How can I help my child prepare for procedures and treatments? If the first treatment does not work in my child, what happens next? How will I know if we need to go back to the hospital or see the doctor? Will the HSP come back? How will I know? Your healthcare team will speak with you and your family about any long-term effects your child might have with HSP. Your doctor may ask you to do urine tests at home to find out whether the HSP nephritis (HSP with kidney involvement) has gone away (gone into remission). You will be given special, clean containers to collect the urine and dipsticks to dip into the urine and check for any proteins and/or blood in the urine. Your child’s healthcare team will show you how to do this. When the HSP goes away, this is called remission. In most children the symptoms and signs of HSP go away within one month. Some children may have problems for up to three months or longer. The purpura on the skin disappears – and usually does not leave any scars – and the joint pains and tummy pains go away. For children with HSP nephritis (where the kidneys are involved), your doctor will check for continued protein and/or blood in their urine. In a few children, the symptoms and signs come back, usually within one year. This is called a relapse. These children may need to go back to the hospital, and may need further treatment. • his or her height and weight checked, and blood pressure measured. • blood tests – to check for the amount of protein and other substances in his or her blood, and measure his or her kidney function. Most children have no long-term effects from HSP. However, your doctor will let you know if your child needs to see a specialist kidney doctor in adulthood. In a small number of children with HSP (fewer than five in 100), the kidneys stop working as well as they should – this usually happens slowly, often over many years. This is called chronic kidney disease (CKD). These children may need further care. They will need to go back to the hospital or clinic for regular follow-up appointments. If your child has CKD, you will learn more over time about how to help manage the condition, and what to expect. Children who have HSP can usually do the things that other children their age do. They should be able to continue going to school or nursery. They can play with other children and, once they have recovered from the initial illness, they can be normally active. This can be a difficult and stressful experience for your child and the whole family, including other children. This is the end of the information on HSP. If you would like to read more about other kidney conditions, tests and diagnosis, treatment or supporting information, you can find a list of topics covered on the infoKID website at www.infokid.org.uk. Version 2, Febuary 2017. © RCPCH, BAPN and BKPA 2013, all rights reserved. Reviewed by: Febuary 2020.